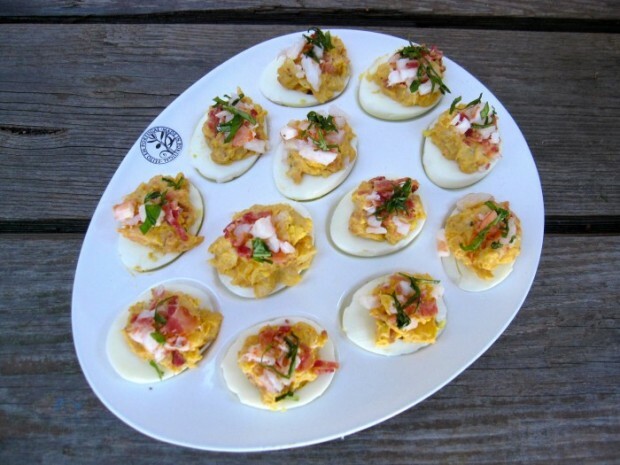 Here’s a variation on stuffed eggs that you may find quite savory. Leftover shrimp were sitting next to a carton of eggs in my fridge and, voila, the following recipe was born. Certainly the addition of bacon didn’t hurt one bit, and I loved the tang of the pickle juice and tomato paste, reminding me of the flavors in a remoulade sauce, so delicious with shrimp. They were devoured in a nano-second at a neighbor’s gathering I attended this past weekend. You will have extra stuffing, which was much appreciated served with crackers after we returned from the party. Whisk together mayonnaise, tomato paste, Dijon and pickle juice. Halve eggs lengthwise. Remove yolks from egg, coarsely chop and stir into dressing with bacon and shrimp. Season to taste with kosher salt and freshly ground pepper. Fill egg whites evenly with yolk mixture. Sprinkle chopped scallions or basil over top and refrigerate until ready to serve.